My very first action would be to deeply asses the situation as best I can, because further decisions will hinge greatly on that assessment. This involves verifying the extent of the situation and other things that may have occurred as a result. One way will be to turn on a portable AM/FM/Shortwave radio and listen. Depending on the event or potential grid-down situation, some stations may be on generator and broadcasting news & information about the situation. 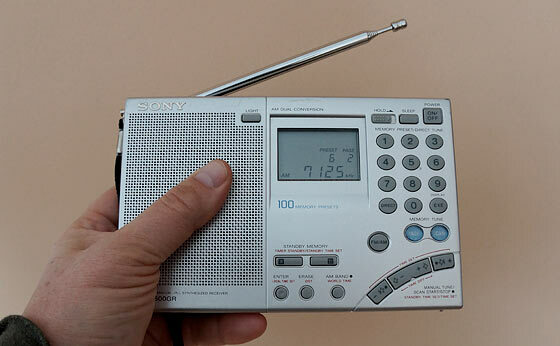 Years ago I bought the following battery operated portable shortwave radio. It’s there at home when I need it (it’s a fun hobby too). I also take it with me on EVERY trip that I go on (vacation, etc..) for just in case. (UPDATE) The radio linked above is apparently no longer manufactured (you can still buy one Used – as you can see in the link). Too bad because it was THE best in its class. That said the following equivalent is what I would purchase today. It looks like a great portable shortwave radio that’s highly reviewed. Where do you tune the radio for information? You might simply tune / scan the individual bands for anyone who may be broadcasting in order to gather some information about what’s going on. If you have a good shortwave radio like the one listed above, you will also be able to pick up many HAM radio bands where you might possibly hear other HAM radio operators around the country and world who may be transmitting with battery power or alternative energy sources. Never thought about bringing a radio on a long trip. Everything has been geared to getting home. Your right though, a radio can be instrumental in getting key information that will help you get home. Another hole plugged. I keep a small emergency radio with AM/FM and the emergency weather channels in the truck, but never considered a small affordable SW radio. That Tecsun is too affordable to not add to your kit. Thanks for the link. I was surprised to see its very low price tag. Note: I do own the Sony but not that particular Tecsun. The reviews however seem adequate and for the purpose of SHTF information-discovery, it looks to be good enough! Note: There is no SSB (single side band) on the low cost Tecsun and may limit the ability to hear ‘HAM radio’ operators (who most always transmit on SSB on the HF bands). Also apps for Iphones and tablets. We’ve been carrying much smaller weather radios with us, but just ordered a Crane shortwave and the Sangean antenna booster for it, to use instead. Palm to face, can’t believe I never thought “shortwave” at all. Ken, both seem very good at both price points. The Mrs. and I each have a Kaito KA500 in our bags we got in 2014, no promoting them just adding more info, they are middle of the road functionality to me. Aye radios, those old time communication devices found among piles of yard sale items. I actually look for some of the old CB/SSB models. I currently have one in every vehicle, and a Base model. Along with handheld models. The Single Side Band offers more power and distance. And if modified the ability to talk in private. Shortwave or Ham as it called, has the ability to talk over long distances. But in normal daily life requires a license. Compact receivers that cover many bands are good for listening, and collecting information. But with direct communication specific questions can be asked or answered. In short after the smartphone becomes useless, older technologies will again have a use. They are on my tangible asset list. One more thing added to my wish list. You can get a pretty good VHF/UHF ham radio for not much more than the Sony and you’ll be good on all the repeaters in your area. A good (used) HF rig would start around twice that. The license to operate these radios will cost you $15.00 to take the test and studying is free. Find a ham or a radio club or group in your area for more info. It’s not hard and you DO need a license to practice. You can listen without a license and in a shtf situation that is mostly what you should be doing, but with a license you can begin to communicate. A short wave to listen in seems to be a great idea but what about the old fashioned CB? I am unsure how hearing the BBC will let me know about my local area road conditions while I am trying to get home. I guess what I am asking is what kind of information would we get off of shortwave?? Sorry to sound ignorant in this matter. If you have SOP’s for your family you could have code phrases that hopefully friendly CB strangers could chain across that 1000 mile trip. As far as Ham radios every one I’ve seen are stationary set ups with impressive antenna, not exactly what I expect to be driving with?? I carry in my truck a CB that gets regular channels, plus LO and High channels. We use them a lot when we are hunting. In a few cases I have turned it on when traffic is backed up to listen to the truckers too find out what is going on ahead and what I need to do to get out of the back up and get on my way. While hunting we are surrounded by 100s of thousand acres and i can listen to truckers and others conversations. I can’t talk to them because they are too far away but I have listened to people several 100s of miles away. I hunt in N. FL and have listened to people in Ga and Ala. Mainly truckers. I know that Truckers put boosters on their CBs and antennas that can reach a very long way. They are always a good source to find out what is going on. Also there are mobile Ham operators that I have seen on the road. If you do some research you can spot them easily. They are also a wealth of info. A CB radio will mostly provide local communications. Listening to ‘shortwave radio’ and HF (Ham radio) frequencies will enable long range information gathering. In order to discover the extent of major disaster such as grid-down (for example) it would be better to have equipment that would provide the ability to hear communications from very far away (to discover extent, ramifications, etc..). You do not need an ‘impressive antenna’ to receive and listen to HAM radio and shortwave radio communications. However you do need an ‘impressive antenna’ to transmit effectively on those frequencies. Ham rigs can easily fit your car or backpack. Most work on 12 (13.8) volts. I have a vhf/uhf and an hf radio in my car with upright antennas on the roof. I’m a few months late giving you an answer but I just read this article about the radios and your questions. For local information you can go 3 ways, a handheld scanner to receive info, or a 40 channel portable CB will work great to receive and transmit. There’s a CB model that will hook up to your car via a magnetic or window mounted antenna, additionally it has two battery cases, along with a antenna for portable outside the car use if your on foot. For a ham unit, there are many handheld portables that can be used for listening in to local conditions. They run in price from several hundred dollars to as cheap as thirty bucks for a Boefeng UV-5R which I have in my GHB. It picks up dual ham bands, one being the 2 meter band which is used by most local Hams from r local transmissions, along with weather band and FM radio. It’s max range for simplex (person to person) transmission is only about 5 miles max based on conditions. I have received transmissions Transmitted up to 30-50 miles away conditions permitting. I can pick up my local 2 meter Ham band repeater which is 5 miles out no problem. For SW radio listening, there’s not much local info you can pick up on SW as most US broadcasters on SW are religious in nature. You can pick up overseas broadcasters like VOA, Radio Romania Intl., Radio Havanna Cuba, China Radio Intl., and BBC who broadcast in English at certain times. A good all around portable SW radio I have and use is a Tecsun PL-660. It has AM/FM, SW, Air band, and SSB (single side band USB/LSB) so you can pick up Ham transmissions but it is only a receiver, not a transmitter. In a SHTF situation the FCC says you can transmit in an emergency situation without a Ham license, but I recommend you study and test for the entry level Technician license. I hope this info answers most of your questions. I am a licensed ham and I can talk to the east coast from the northwest on my way to the store in the morning in my Ford ranger. It takes some work, but it is possible. My home station I can talk (or CW ((morse code)) with)anyone in the world, depending on propagation. It is a fun hobby, lately I have been using a portable antenna with 5 watts on HF and making contacts all over here in the US and abroad. note the cheaper radio does not accept an external antenna. and a nice portable little GRUNDIG M400. It has knob tuner on the side. Its small, about the size of a laptop hard drive, takes 2xAAA batteries, and has a telescoping antenna that is approx 1 foot in length. It came with ear buds. I took it on a cruise once, and listened at night. It also came with a little velcro closing case that slips onto your belt, or any molle strap. I don’t know how much I paid for it… am/fm/sw1/sw2 also, an alarm clock. When the power was out the other night, I used it to listen to the fm band to see how far the outage was. Handy lil thing. There is another shortwave radio that I bought KK-9 by Kaide. 7 SW bands, FM/AM/TV and Marine band. Its ok. If SHTF and I had to sell one… I’d most likely sell that one. I also have the BAOFENG Ham 2way radio with a better antenna than the one that ships with it. I programmed all the local EMS etc on it as well as freq’s. – This one, you can program your NOAA weather into it… It too has FM Radio. I keep my SHTF electronics sealed in an EMP Proof can…. Food for thought…. #1 buy a portable with a BFO or capable of picking up single sideband. Learn the Ham Radio bands! Learn to listen to the above! If you got to find a real ham and get him to teach you! 99% will! Take notes…write em down…keep a copy with the radio!